Rob Kardashian just confirmed that Blac Chyna is pregnant with his baby…but did he do it using emojis? Only in 2016 would it be socially acceptable to announce a pregnancy via baby bottle emojis. And Kris Jenner and Rob’s sisters are most likely having an epic meltdown as we speak. Earlier this week, chatter that Blac Chyna was pregnant hit the internet – honestly, we thought it was just wishful thinking, seeing as how we would love to see the look on Kris Jenner’s face upon learning the only true Kardashian heir was being birthed by a stripper, and her daughters’ nemesis. OK! Magazine began the rumors by reporting that Blac Chyna was caught at a club super sober and sipping coke instead of booze. Normally, this wouldn’t be a huge deal, but we’re talking about Blac Chyna. The girl normally parties like a rockstar. Chyna turning down alcohol is basically a pregnancy announcement in itself. Rob Kardashian’s latest posts on social media seem to support the pregnancy story. 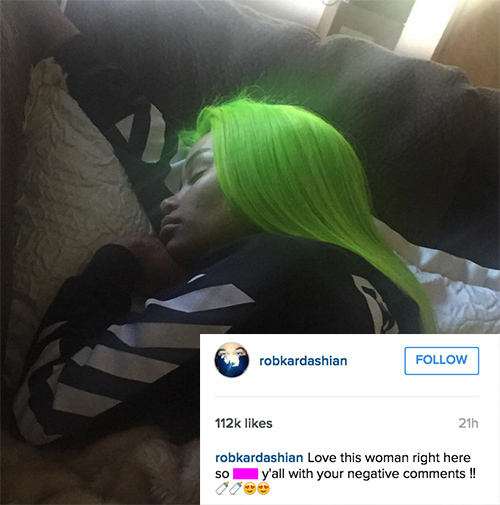 Rob shared a video of Blac Chyna sleeping (because, hey, being pregnant is exhausting) and he captioned it, “Love this woman right here so f—k ya’ll with the negative comments.” The caption was followed by emojis – not just any emojis – but baby bottles! In case you still aren’t convinced, and Blac Chyna being sober and baby bottle emojis didn’t seal the deal for you, there is also a cryptic social media post from Chyna’s mother, Tokyo Tony. Tony announced that she is going to Los Angeles to visit “the kids.” Technically, there is only one “kid” – Chyna’s son King, whom she shares with Tyga. But could Tony be referring to the unborn Kardashian? What do you guys think? Is Blac Chyna really pregnant with Rob Kardashian’s baby? Seriously, wouldn’t this be the greatest twist EVER!? And how funny would it be that Kylie’s step-son’s half-sibling is actually her niece or nephew? Way to keep it in the family guys!